Composable Nomination Classic Gold and Cubic Zirconia Nature Blue and Orange Flower Charm, a stainless steel base link with 18ct Gold and Cubic Zirconia. Composable Nomination Classic Gold and Cubic Zirconia Nature Blue and Pink Flower Charm, a stainless steel base link with 18ct Gold and Cubic Zirconia. Composable Nomination Classic Gold and Cubic Zirconia Nature Blue and Red Flower Charm, a stainless steel base link with 18ct Gold and Cubic Zirconia. 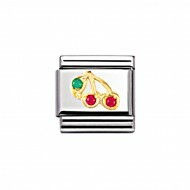 Composable Nomination Classic Gold and Cubic Zirconia Nature Cherries Charm, a stainless steel base link with 18ct Gold and Cubic Zirconia. 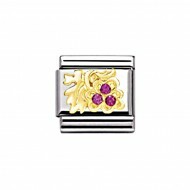 Composable Nomination Classic Gold and Cubic Zirconia Nature Grapes Charm, a stainless steel base link with 18ct Gold and Cubic Zirconia. Composable Nomination Classic Gold and Cubic Zirconia Nature Green and Red Flower Charm, a stainless steel base link with 18ct Gold and Cubic Zirconia. Composable Nomination Classic Gold and Cubic Zirconia Nature Green Leaf Charm, a stainless steel base link with 18ct Gold and Cubic Zirconia. Composable Nomination Classic Gold and Cubic Zirconia Nature Light Blue and Red Flower Charm, a stainless steel base link with 18ct Gold and Cubic Zirconia. Composable Nomination Classic Gold and Cubic Zirconia Nature Orange and Light Blue Flower Charm, a stainless steel base link with 18ct Gold and Cubic Zirconia. Composable Nomination Classic Gold and Cubic Zirconia Nature Pink and Green Flower Charm, a stainless steel base link with 18ct Gold and Cubic Zirconia. Composable Nomination Classic Gold and Cubic Zirconia Nature Red and Green Flower Charm, a stainless steel base link with 18ct Gold and Cubic Zirconia. Composable Nomination Classic Gold and Cubic Zirconia Nature Red and White Flower Charm, a stainless steel base link with 18ct Gold and Cubic Zirconia. Composable Nomination Classic Gold and Cubic Zirconia Nature Red and Yellow Flower Charm, a stainless steel base link with 18ct Gold and Cubic Zirconia. 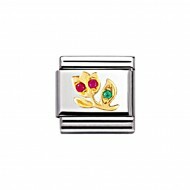 Composable Nomination Classic Gold and Cubic Zirconia Nature Red Tulip Charm, a stainless steel base link with 18ct Gold and Cubic Zirconia. Composable Nomination Classic Gold and Cubic Zirconia Nature White Leaf Charm, a stainless steel base link with 18ct Gold and Cubic Zirconia. Composable Nomination Classic Gold and Cubic Zirconia Nature Yellow and Green Flower Charm, a stainless steel base link with 18ct Gold and Cubic Zirconia.